Vice President and Prime Minister of the UAE and Ruler of Dubai His Highness Sheikh Mohammed bin Rashid Al Maktoum attended the Windsor Royal Endurance Race in Britain in presence of His Majesty King Hamad bin Isa Al Khalifa of Bahrain. 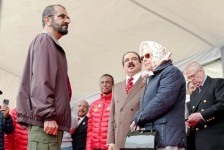 On the sidelines of the endurance event, His Highness Sheikh Mohammed met with Her Majesty Queen Elizabeth II of Great Britain. He applauded the excellent organisation of the event, which celebrates its 75th anniversary this year, and highlighted the strong ties between GCC countries and Britain in endurance races. His Highness Sheikh Mohammed followed the 120-km endurance race in which 110 riders from the UAE, Bahrain, and a number of European countries vied for the title. Chairman of the Supreme Council for Youth & Sport and President of Bahrain Olympic Committee Sheikh Nasser bin Hamad Al Khalifa managed to clinch the title for the Bahraini team finishing in 05:04:48 hours. In the second place came Sheikh Rashid bin Dalmouk Al Maktoum (05:04:49 hours) followed by Abdullah Ghanem Al Marri finishing in third (05:04:52 hours). The Windsor Royal Endurance Race was attended by sheikhs, officials, and endurance race enthusiasts.